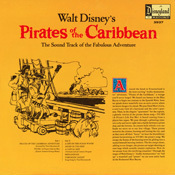 Record Comments: This album includes the soundtrack to the attraction featured at both Disneyland and Walt Disney World theme parks on side one. 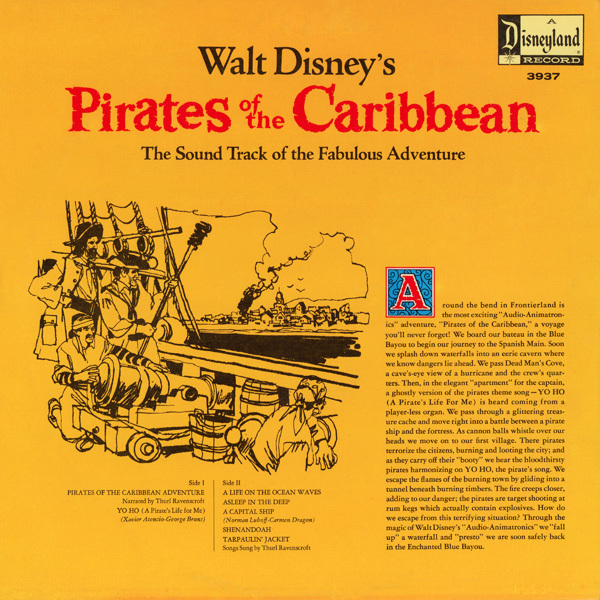 Side two includes sea-worthy pirate songs sung by Thurl Ravenscroft, previously released on DQ-1233 Walt Disney's Little Toot And Other Sailor Songs With Chip 'N' Dale. Other recycled material include sound effects from DQ-1257 Chilling, Thrilling Sounds Of The Haunted House. 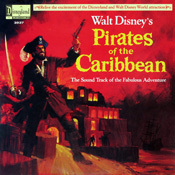 This record was also released as Story Teller version that includes illustrated book pages. The issue pictured here has a standard record jacket with no book pages. 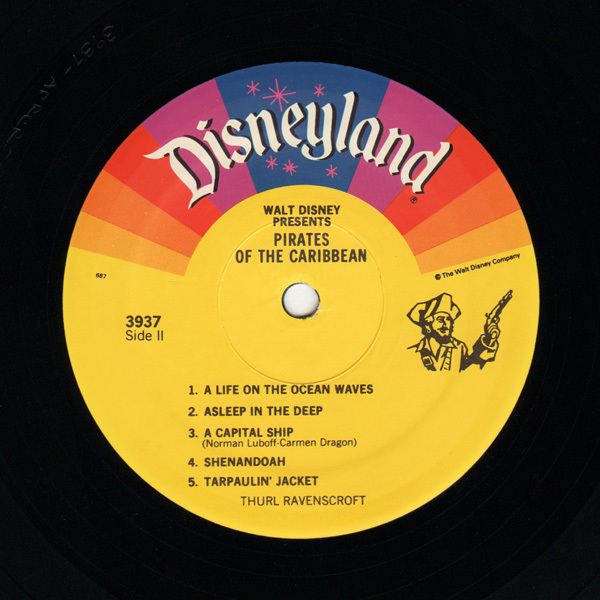 Subject Notes: The Pirates Of The Caribbean is a Disney attraction that made its official debut in 1967 at the Disneyland theme park in Anaheim. With Walt Disney passing just three months before it opened, this was the last attraction whose construction was overseen by him. 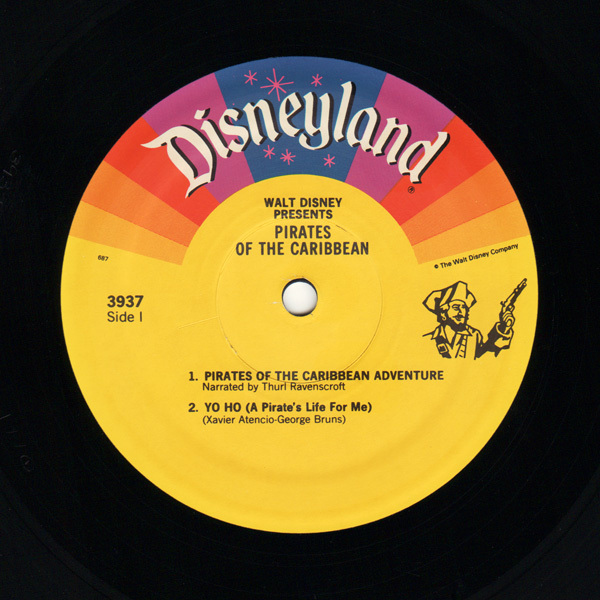 The ride was later added to Walt Disney World's Magic Kingdom in Florida in 1973, to Tokyo Disneyland in 1983 and to Disneyland Paris in1992. A reimagined version of the ride, Pirates of the Caribbean: Battle for the Sunken Treasure, opened at the Shanghai Disneyland Park in 2016. 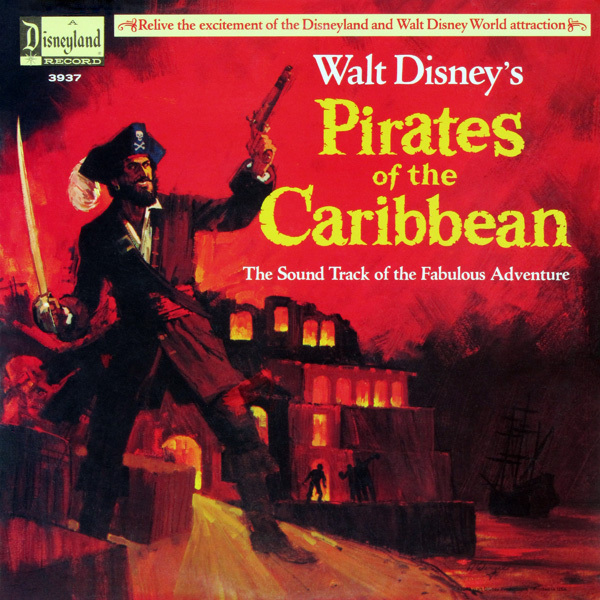 In July of 2003, a live-active movie was released that was based on the theme park attraction, subtitled "The Curse of the Black Pearl." Others include the 2006 release of "Dead Man's Chest," the 2007 "At World's End," the 2011 "On Stranger Tides" and the 2017 "Dead Men Tell No Tales."